Today I played with the "View Master" technique. This is another one of those techniques that I've always wanted to try but didn't because it looked like it was too difficult. I found a good tutorial on Split Coast Stampers. I did change a few things to make it quicker and easier to do. I used the Framelits circle dies instead of a Coluzzle. As long as the disk is smaller than the inside of the card/layers, you are okay. I also penciled the circles in on my disk, making them about 1/4" apart. And I marked them on the side where the dial part is so I would know not to stamp above that mark or the image would show through in the upper window. I covered my brad with the leaf of the flower so it doesn't show at all. Making the card look even more mesmerizing! It was a very fun card to make. I just wished I had other images to use but there's not a lot of small current images to be had lately. What's up with that? I used the "Petite Pairs" set for the words. And for the third window I used a flower from the "Petite Petals" set. I used the decorative paper from the "It's My Party" 12" x 12" paper stack. I told you I was trying to use it up! I know it won't happen but I'm working on it! It would be a first for me!! Though one thing nice about left over 12" x 12" paper, you can make fun gift bags with it. You can find a really easy tutorial for the bag here. I used the Botanical Builder from the 2016 Occasions catalog to make my flowers and the leaves. 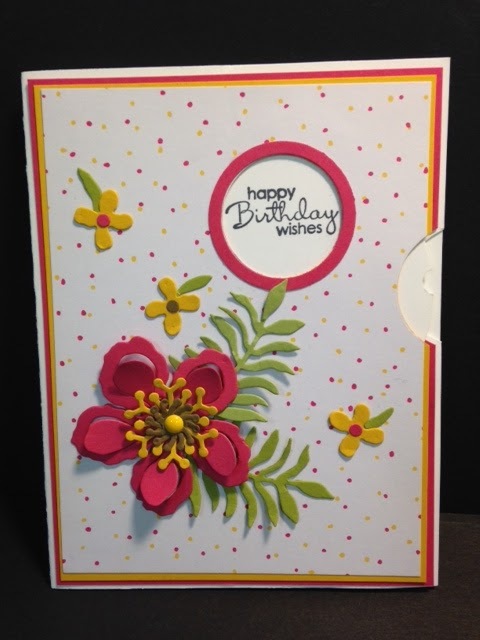 The center of the tiny flowers are just 1/8" punched circles of card stock. The larger flower has an enamel dot in it's center. I was very pleased with how my card turned out. Keep in mind when you are making these that you can not use anything 3-D on the disk. It will not turn easily and will create a bump on the front of your card. Just keep it flat and use inked images only. Cut your card stock and copier paper circle at the same time. I saved my copier paper disk so I won't have to spend any time making another one when I am ready to play with this technique again. I don't think I encountered any other issues. It was fun to make and I would LOVE to make another one sometime soon! Have fun with this technique! I really did enjoy playing with it!